Market Your Real Estate Investing Business? Knowing how to market your real estate investing business is the most important part of this line of work. Why? Think of it this way: if people don’t know you exist then how are you going to get leads? The truth of the matter is, as the owner of your own business you need to be wearing lots of different hats. And the most important one has got to be marketing. 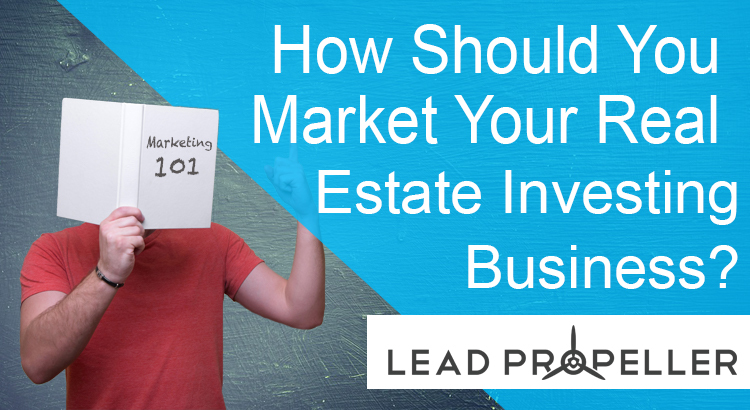 You can’t get leads, or connect with other investors, or sell your inventory if you don’t market your real estate investing business. But knowing which strategy will work best for you is a tricky thing to do. That’s why we’re going to look at different kinds of marketing tactics for real estate investors so that you can find the one that works best for you! In all likelihood, you’re going to be using a combination of a marketing strategies. You can’t just rely on only doing Craigslist ads, or only doing content marketing. Let’s take a look at the different types of effective marketing for real estate investors, and at the end of this article you can see which one you’re not doing enough of. That way you can expand your marketing strategy to generate more leads. And there’s nothing better than getting a consistent flow of leads! Let’s go! So, yeah, research before you start posting signs everywhere. Let’s make that more practical. Let’s say you spent $1,400 on 5,000 postcards, and you got 50 responses back. That’s a 1% response rate, which is pretty good. Now, of those 50 responses let’s say you were only able to close 10 deals. That’s an astonishing 20% conversion rate – that’s amazing! Don’t get too excited though. Direct mailing is great, for a while. But keep in mind how spammy it looks. Take yourself as an example. When you get a salesy letter in the mail what do you do with it? I’ll tell you what I do: I check for a coupon and, regardless if there’s one or not, it goes right into my recycle bin. Why would motivated sellers be any different? Well…they’re not. So, should you be doing direct mail to market your real estate investing business? Yes, absolutely. But don’t rely strictly on direct mail for lead generation. We covered this in another blog post about the difference between inbound and outbound leads. Leads that come from direct mail are outbound, but the most leads you can generate come from inbound sources. Generating leads online is definitely the way to go when it comes to how to market your real estate investing business. We’ve talked pretty heavily on online lead generation, but never directly compared to other marketing methods. So let’s take a look at how you can better market your real estate investing business online. Ok, not only Google Adwords, but PPC in general. You should be advertising on Bing and Yahoo, but their platforms are virtually identical to Google Adwords so we’ll be focusing on that one. Plus, Google Adwords performs at a higher rate than Bing or Yahoo. Like we went over in our PPC blog post, using Google Adwords to market your real estate investing business will get you to show up above organic results in searches. Which is awesome! Why? Because when a motivated seller goes to Google something like “sell my house fast“, your business will show up in their results before your competition. And BOOM that’s how you get a lead. After all, the best place to hide a dead body is on page 2 of a Google search. ProroFuse.com found that page 1 of Google search results get 91.5% of the traffic generated, and of that high percentage the first result gets 33% of the clicks on the page. Question: is PPC worth it? Content, content, content! It’s all about content! All of these content elements should always – always – lead back to your services. For example, in this blog alone we’ve already linked back to other relevant posts we’ve done in the past. Why? To help our readers navigate our content to better inform them of strategies to grow their real estate investing business. That’s the strategy you need to have when you’re working on content marketing. All of your blog posts, social media posts, video and podcast descriptions all need to link back to something relevant from your website. Keep in mind, though, that content marketing is a long-term marketing strategy for your real estate investing business. If you want a take off plan, that’s PPC. Content marketing, on the other hand, grows slowly but steadily. Having blogs with useful keywords will build audience interaction over time, which will also build your Google page ranking. And remember what we said about ranking: the higher the better. Content marketing is all about SEO. We have an SEO checklist here for you that you should definitely look at before you publish any blogs to your website. If you want an SEO strategy, but don’t have the time to devote to it, you should check out our professionally managed SEO service for your real estate investing business! Time to Find out Which Marketing Strategy You Should do Below! We made this quiz specifically to help you find the best marketing strategy to add to your repertoire based on what you’re already doing! Don’t forget to share what kind of marketing strategy you should try in the comments!